Happy summer Monday, everyone! (Hopefully, for everyone... and for those of you still waiting for that last day... the end is in sight!) 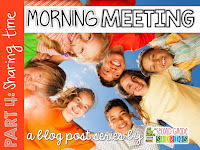 This is the last part in my series on Morning Meeting. 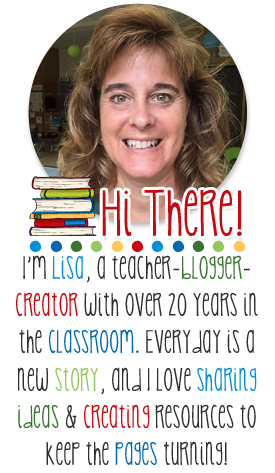 Do you do a sharing time with your students? I admit. I had a love-hate relationship with sharing during morning meeting. On the one hand I know how important it is. It helps students (and teachers!) to get to know each other. It provides opportunities to practice listening and speaking skills. Another confession - I know my students got bored listening to what everyone did over the weekend. Every Monday for Weekend News. It began to be the same thing over and over. Johnny played video games. Ryan watched tv. Sharing became LAST on our list of things we enjoyed about Morning Meeting and FIRST on the list of things to go by the wayside when we didn't have time in our day. But.... the teacher guilt set in. I knew that sharing was an important part of building relationships with my students. Sharing was window into what went on outside of school and I just did not want to give that up. But something had to change. I started to think about what I REALLY wanted from our sharing time. - Sharing during Morning Meeting (or any time during the day) needs to be purposeful. - It needs to be structured. - It needs to be engaging. Whether you share with your students everyday, once a week or just once in a while, try some of these ideas to put a fresh -- into your sharing time. Weekend News: go around the circle and give everyone a turn to greet the person next to them with, Good morning Evelyn (or whoever). What's the news?" And yes, I do let students pass - especially at the beginning. For some students, sharing in front of everyone is just too much. And for some students, their weekend events may not be ones they want to share. Trust me, after a few weeks everyone starts to share. Soon after Weekend News has begun, we add a new piece - making comments and asking questions. (We've already made anchor charts for how to be a good listener and speaker and modeled these behaviors. This is the next step.) We talk about asking questions first. What makes a good question? What more do you want to know? I listen to the questions asked and use those for quick mini-lessons. I once had a group of kids who just could not get away from questions like, "What time did you see the movie?" "What color were the blocks?" We make an anchor chart of question stems and refer to it when someone can't think of a question. After we're good at asking questions, we move on to making comments. Same idea... same procedure. We talk about making sure your comment does not have "I" in it. We want to focus on what the person has shared. "5 Little Words" is another way to keep the stories from getting to drawn out. Students can only use 5 words to share their weekend events (or whatever number you choose.) For example, "camping, rain, muddy, cold, awful!" Need something a little different? How about "Give Me 5!" Call on three students to answer each of the following: 1) good news 2.) compliment someone 3. )something you're thankful for in the past 24 hours 4.) joke or something funny 5.) a question of your choice for everyone to answer. Question of the Day: Write it the whiteboard. Pick from a bunch in a jar. "What's your favorite ____?" "What animal would you like for a pet?" "Do you think we should go outside even though it is snowing?" Do some "Would you rather...?" This is a quick way to share. We go around the circle, everyone responds. Boom! - 2 minutes tops. Try tying the question into what you're studying - writing, reading, science... anything! Topics: How about a different topic for each month? The first couple months can be share something you're good at, something you like to do... (you decide if bringing something in is ok, or if it should just be talking about it.) Tell about your family, traditions, great days in the snow/rain/fall... the possibilities are endless. Involve your students in generating the topics and not only will they be more engaged and interested in sharing, but they'll be empowered and you'll find out what THEY really want to know. For this kind of sharing we have a sign-up sheet. 3 students sign up for each day - and I only plan to do it 2-3 times a week. I had to be realistic - everyday just was not working for me. By the end of the month everyone who wants to share has had the chance. And oftentimes kids who didn't want to sign up to share at first would sign up towards the end after seeing their classmates share. I also have a couple of favorites from Responsive Classroom that I like to incorporate. "Maitre-d" is a fun way to keep the groupings changing. Have one person call out "Party of 3!" (or whatever number you want). Students make groups of that number and share whatever is decided (weekend news, answer a question, etc.) Call out a new party (you can use a new sharing topic or the same one) and make new groups. Easy and fun! Another fun one is "Mill to Music." Put on a song, have students move around, and when the music stops they share with someone nearby. Do a few rounds, then return to the whole group and ask a few students to share what others said. See? 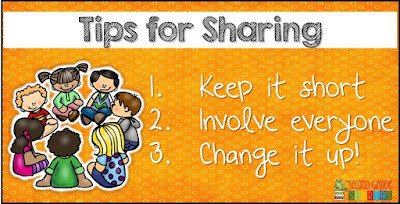 Sharing doesn't have to be filled with long and drawn out stories, blank expressions and forgetful students. Change it up, keep it fresh and do what works for you! If you're looking for ideas for other parts of morning meeting - take a peek at my other posts HERE.